I’m a disaster junkie. Natural disasters amaze me. I hate it when people get hurt, but the forces of nature that create the disasters leave me awestruck. 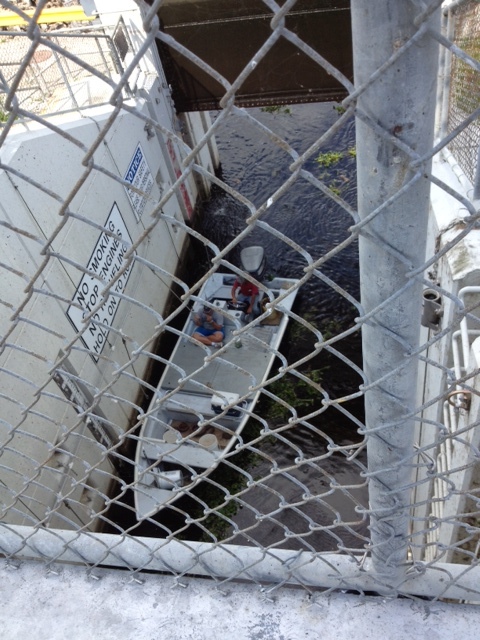 A couple years ago, I learned about Lake Okeechobee, a sinkhole that is the seventh largest freshwater lake in the United States. That’s a big sinkhole!! 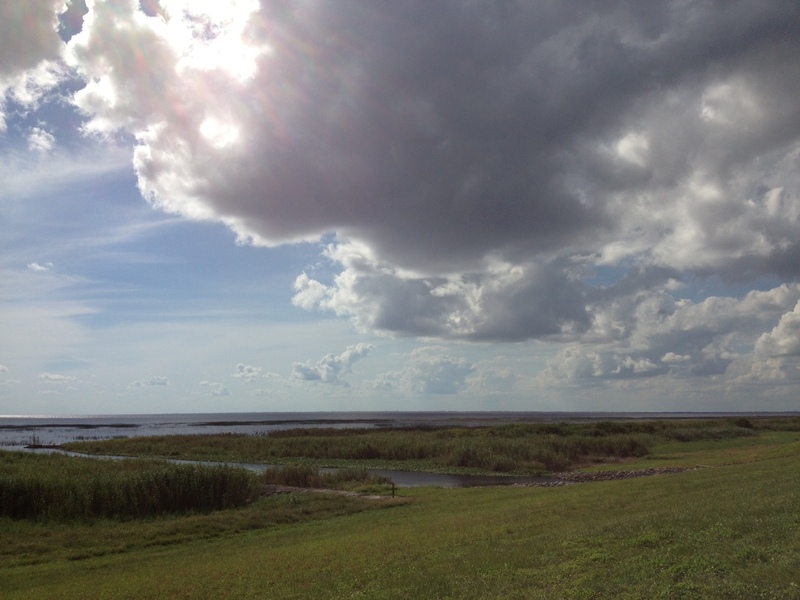 I also learned that tragically, in the 1920s, hurricane winds blew water over the tops of Okeechobee’s levees, which killed hundreds of people. Since that time, the levee tenders say they’ve rebuilt to withstand anything the Earth can send their way. (Hmm. Where have I heard that before?) There is apparently some controversy about whether this is true. Knowing all this, I had to see Okeechobee for myself. 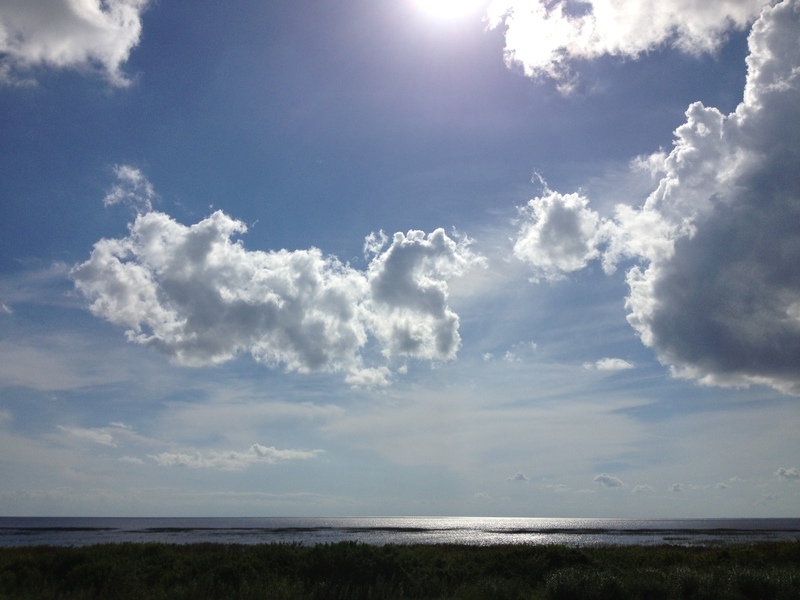 A family reunion staged on both coasts of Florida gave me the opportunity I needed. As my son and I drove from the Atlantic to the Gulf, he agreed to a detour so that I could see my sinkhole. 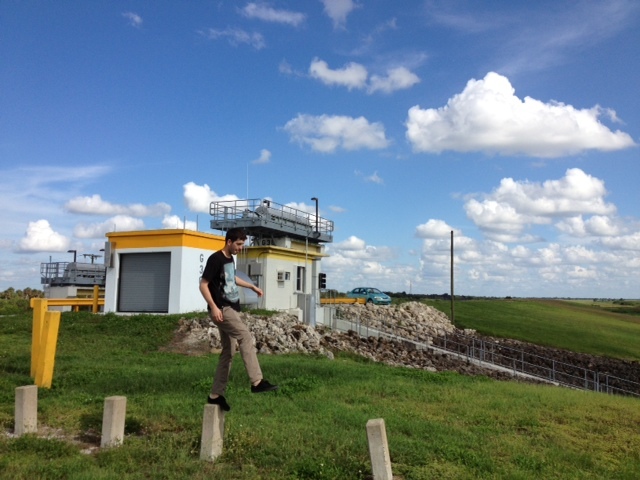 I only got to make one stop at Okeechobee, and that briefly. (I hope to go back for a longer visit someday — probably alone.) Still, it did not disappoint. 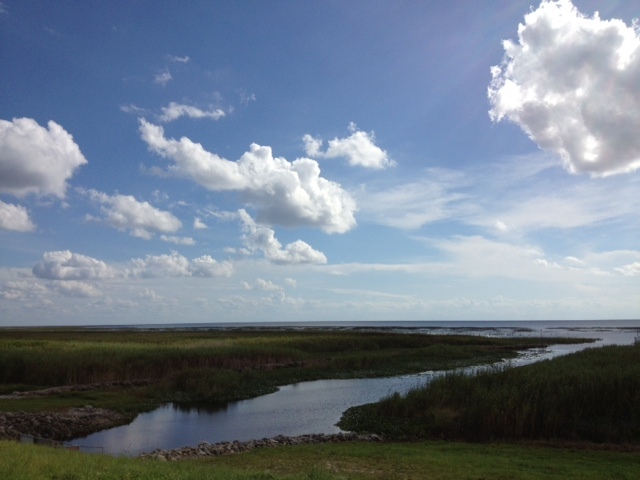 The “moat” around Lake Okeechobee. 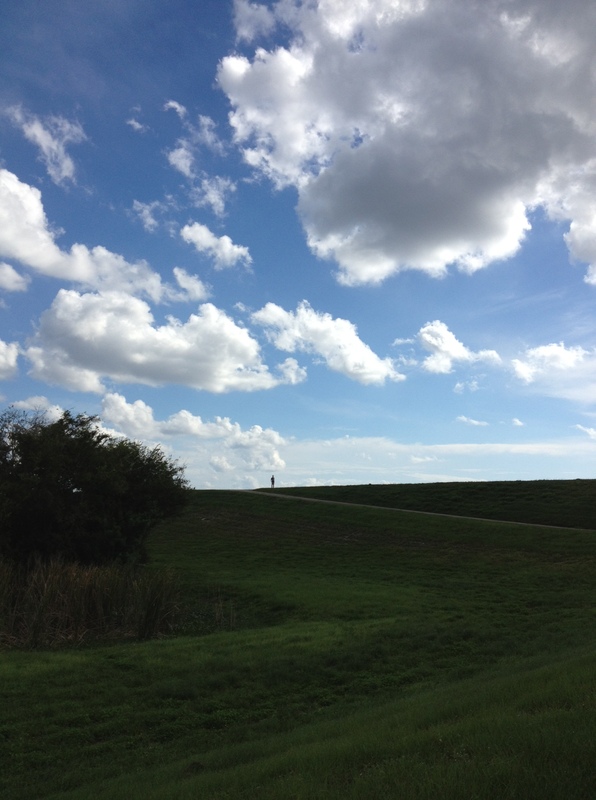 That human speck at the top of the levee is my son. Fishing boat heading for the lake. In the background, the bunker. In the foreground, my son jumping from post to post. Florida has a lot of sky. Many of the levees are topped with biking and walking trails. It could be fun to circle the lake!… Maybe… The circuit would take more than one day…. That is indeed a large sinkhole. Sometimes I think if I lived in Florida, then I would have visited this place and known all these cool details. Clearly this is not the case. Also thank you for sharing (and visiting). If you decide to circle the lake, let me know. I’ll bring the DEET. Yes! Let’s do it! Just let me know the next time you plan to be in Florida.